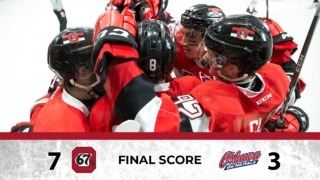 The 67’s host the North Bay Battalion this Sunday at The Arena at TD Place. This will be the third matchup between the clubs this season but it will be the first one played in the Nation’s Capital. Here’s who fans should keep an eye on when they get their first look at the Battalion this season. A player to watch from last weekend, it is only fair that Sasha is featured one again this week. The 19 year old has been on fire as of late. The San Jose Sharks prospect is on a four game goal streak, seven game point streak and has 16 points in his last 5 games! That’s more than an average of three points per game in his last five played! In that stretch Sasha has had three four point games and one three point game. That brings his total to 10 goals and 24 assists for 34 points in only 26 games played. After a bit of a slower start, things are clicking for Clark. The 19 year old has six goals in his last seven games played and 10 points in his last five games. The second round pick for the defending Stanley Cup Champions the Washington Capitals also recently signed his first professional contract with the club in October. Since signing his deal Clark has gone off for 18 points in just 14 games, which is big step up when compared to his four points through the first 14 games of the year. Clark has a dangerous shot in the offensize zone and has a knack for getting under the opponents skin and in their head. At 6’2″ Klark has the ability to use his size to his advantage and has a level of grit to his game. Don’t anticipate a fight from him though as he’s already dropped the gloves twice this year and will look to avoid his third and suspension. 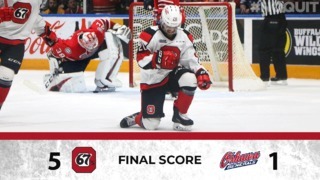 The mantra for the 67’s is No Quit but the same could be said about North Bay over-ager Justin Brazeau. The 20 year old was a 13th round pick in the OHL and went undrafted in the NHL. He has attended NHL camps with Detroit and Columbus but hasn’t landed himself a professional contract. That hasn’t the wind out of sales, but fueled his fire. 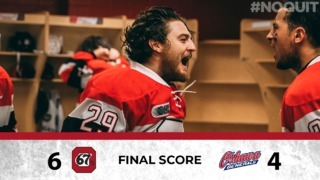 The 6’06” right winger finished last season with 75 points in 68 games and he is already well over halfway to eclipsing last season’s point total only 25 games into the year. Brazeau has 23 goals and 24 asissts in only 25 games this year. He’s scoring at 1.88 points per game clip and shows no signs of slowing down. He sits second in league scoring and tied for third in goals, trailing 67’s forward and league leader, Tye Felhaber by three goals. It’ll be tough to miss Brazeau on Sunday both due to his towering frame and skill on the ice. Puck drop for Sunday’s contest is 2:00pm and you can get your tickets HERE.